Microsoft Answers gets rebranded as Microsoft Community - with exciting updates! Microsoft Answers gets rebranded as Microsoft Community – with exciting updates! Microsoft Answers, the community service and support site for various Microsoft products gets a new branding along with lots of exciting updates. 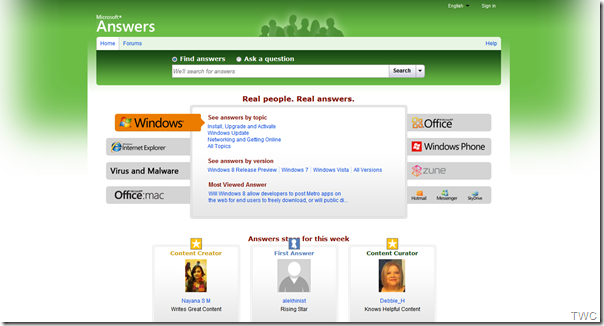 The site name has been changed from Microsoft Answers to Microsoft Community. The URL for the site will however remain the same. The new revamped site has gone live just a few hours back. 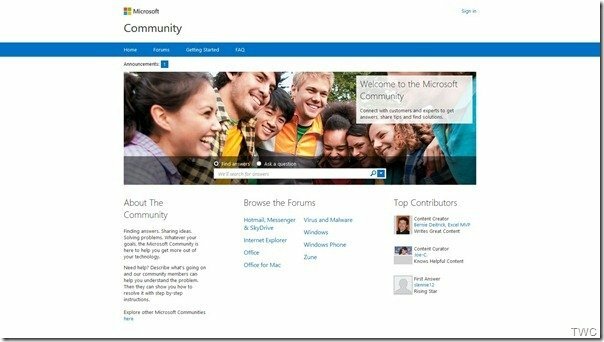 Microsoft Answers is now Microsoft Community! We’ve got a new name and a new look, but the Microsoft Community will continue to provide the same great questions and answers that you rely on to get the most out of your technology. The site is completely revamped with new design and other feature updates. It has received a clean new look ! – The home page, gets a new Navigation bar. Three additional new items have been added – ‘Getting Started’ , ‘FAQ’ and ‘Additional Support’ to the present items of ‘Home’ and ‘Forums’. – The Getting Started links have been changed to the new Getting Started page. – Additional Support provides additional support links to Microsoft Support. The ‘Find it Myself’ link links to Support content pages, ‘Get Live Help’ link links to the Get Support page which gathers any needed information and passes the User to Get Support site. The logos of various products in their respective pages have been removed, thus providing more space for the content . Everything has been updated – the icons at various places, Vote & Me too style updates, Footer with language switcher, Thread lists, thread status and more. This new name is also expected to reduce confusion with Microsoft Answer Desk. Have a look at the revamped Microsoft Community!